Pets are part of the family, so why wouldn’t you want to share your holiday with them? With Lakelovers, you can. We have hand-picked a large selection of pet friendly luxury cottages. From contemporary conversions to traditional cottages and ‘could-be’ castles. So there’s plenty of luxury dog friendly cottages Lake District to choose from. Both you and your pet will feel right at home with our luxury pet friendly cottages Lake District. After all, they’re all VisitEngland 3-5-star graded – and we don’t charge extra. The Lake District is fast becoming the leading destination for dog lovers in the UK. So don’t put your pooch in the kennels, take a look at our pet friendly luxury cottages. Come and see why dogs and their owners love the lakes so much. The Lake District is so dog-friendly that in 2014 it was handed the Kennel Club Great Outdoors award. And then the Lakeland town of Keswick was named as the ‘most dog friendly town in the UK. So, there’s no better reason to visit is there? But many B&Bs, hotels and cottages don’t allow pets to stay. So you may think that those who do accept pets won’t be of a high-standard. But you don’t have to settle for second-best accommodation on your Lake District holiday. At Lakelovers, we believe that you and your pooch should have a top-class stay. That’s why we offer luxury dog friendly cottages Lake District – have a look, you won’t be disappointed. 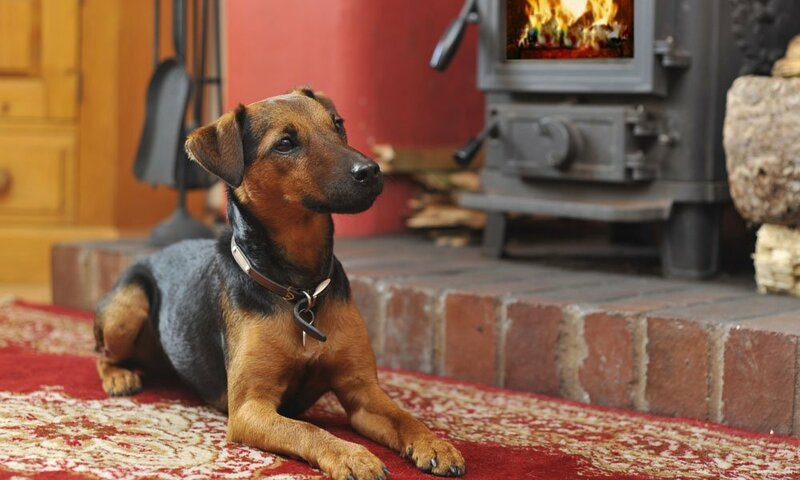 Imagine cosying up on the sofa curled up with your canine pal in front of the roaring open fire on a winter’s night. Or on a warm summer evening, playing a game of fetch with your pooch while you relax with a drink on the terrace. Whatever the season, you’ll have a wonderful time at the perfect place with your pet. Every one of our cottages has its own unique charm and exclusive features. Whether you want a traditional Lakeland stay or a contemporary barn conversion, by the foot of a fell or by a lake. Whatever the reason for your stay – a week ticking off Wainwright’s with your pooch? A weekend retreat to spend time with the family? You’ll have a great time and make amazing memories in our luxury pet friendly cottages Lake District. Dogs have long been a feature of Lake District culture. Border Collies tending flocks of sheep, Hounds and Gun dogs for hunting. And of course the Lakeland and Border Terriers, arguably the best company on a long walk in the fells. Did you know that the sport of hound trailing is pursued only in Cumbria? This is where a scented aniseed trail is laid and the hounds run after it. The hounds can reach speeds of over twenty miles per hour! The relationship between man, dog and the land is ingrained. This makes the Lake District a particularly special place to spend time with your canine pal. Lakelovers proudly support Lake District Mountain Rescue Dog Association, a volunteer-run charity. They save lives on the fells and lowlands of the Lake District National Park all year around. There’s lots of exploring to be had with your dog in the Lake District. A stroll around waters and tarns such as Coniston, Tarn Hows or Rydal Water, which are good-sized walks. Or, if you fancy a more strenuous walk with your pet? There are walks to the top of one of the famous fells, such as Helvellyn or Cat Bells. And, at the end of a long day of fun, treat yourself to a well-earned drink in one of the region’s many dog friendly pubs or bars. Before heading back to one of our dog friendly luxury cottages. The Lake District has so many traditional pubs and renowned eateries – and many allow dogs to join you. The Watermill Inn in Ings, is just one of the many pet-friendly bars. You can enjoy one of the many real ales that the Inn offers, including some brewed on site in the Watermill Brewery. In Cartmel, the 450-year-old Cavendish Arms is another popular choice for dog owners. As is the The Drunken Duck where many of the ales on offer are brewed on site at the Barngate Brewery. The beers are named after pet dogs, including Tag Lag, Red Bull Terrier and Cracker! So, if you’re looking for a breakaway and which both you and your pet will enjoy, then the Lake District is a good choice. And, for pet friendly luxury cottages Lake District, then Lakelovers is the perfect choice. And, you don’t have to leave your pooch at home. They can come and stay too because they are more than welcome in one of our 175 pet-friendly homes. Their stay will be just as comfortable as yours. So, come and share the summits with your pet, they’ll love you for it. So, why not take a look at our fabulous pet friendly cottages now for a breakaway you won’t forget. You are on page 1 of 14.